•Small ABS Enclosure 3.25" X 2.5" X 1.125"
The Point Sensor Analog wireless transmitter is a battery operated 12 bit analog-to-digital converter with a microprocessor controlled 418 MHz, 433 MHz, or 900 MHz. FCC certified radio transmitter. The Sensor has an on board time of day clock that allows it to spend most of the time in a low power quiescent state. At predetermined time intervals the clock will wake up the onboard microprocessor. Unique serial number information is read from a Dallas Semiconductor 1-wire digital device and analog data is read from a 12-bit analog to digital converter. This information is combined with a CRC-16 error check and transmitted in a very short data packet which results in a very short transmission time. This architecture allows the Sensor to consume very little energy resulting in a battery life of up to 5 years. The electronics are coated with a conformal material which provides a moisture barrier against condensation; However, submersion in water is not recommended. The service switch is activated by either inserting a special tool through a hole in the top ABS cover (418 MHz & 433 MHz), or a magnet activates an internal read switch (900 MHz). The Sensor is shipped with the transmitter turned off (anytime the Sensor is to be shipped the transmitter should be turned off or must be placed in a shielded container to prevent interference that might cause shipping problems). Start the Sensor by either momentarily pushing the service switch, you will feel the button click (418 MHz & 433 MHz); or by momentarily placing the magnet next to the reed switch as indicated on the product label (900 MHz). When the Sensor starts, a data transmission occurs immediately and a special mark is introduced in the ID field of the transmitted data packet to indicate which sensor is in service or installation. The service switch and reed switch with magnet are also used to put the Sensor in a quiescent mode (no transmissions and very low power consumption). This is the state the Sensor is in when you receive it from the manufacturer. Push and hold the service switch (418 MHz & 433 MHz) for 5 seconds or more; or place the magnet near the reed switch (900 MHz) for 5 seconds or more to enter this powered down state. The (900MHz) sensor also has an on/off switch. 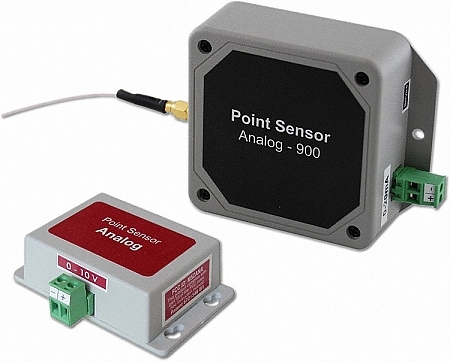 The Point Sensor Analog-900 sensor can be turned off by sliding the On/Off switch away from the SMA antenna connection, turned on by sliding the switch towards the SMA antenna connection.